C Nelson Mfg., Co builds 2 styles of flavorrails. Flavorrails were used years ago for making sundaes, milk shakes, and other soda fountain concoctions. Today because of the growth of smoothies and blizzard type mix-in blended products, the C. Nelson cabinet is now used as, a prep-cabinet, a freezer work-station. A freezer-scoop/work-station for all your frozen/chilled supplies to make your great tasting smoothies, cappuccino’s, milk shakes, and blizzards. The BDF8 is the more traditional flip lid flavor rail which has the heavier duty insulated flip lids along with a well-insulated jar rail. Remember all rails are designed to only hold non-food/spoil-able products (NOT dressings, etc). Chocolate, caramel, peanut butter and other toppings hold just fine. 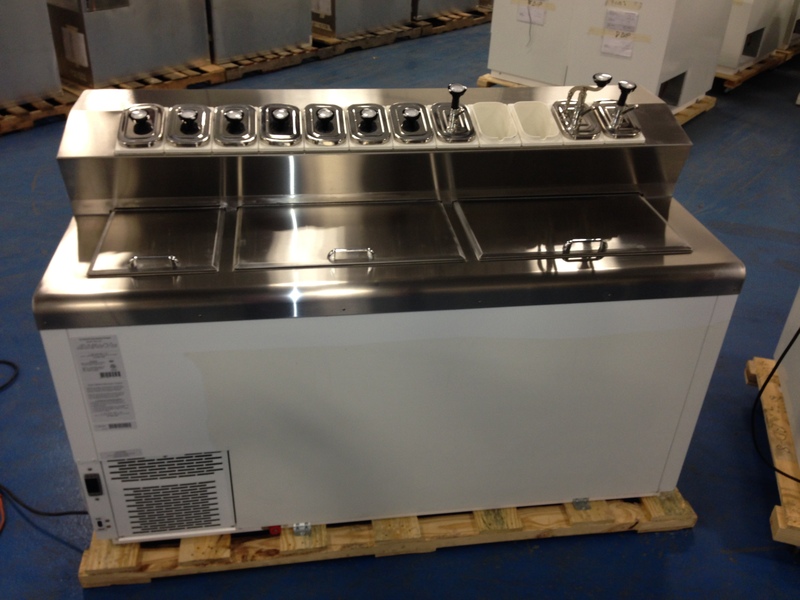 BD-10-JR, Ice Cream dipping and flavorrail cabinet by C. Nelson Mfg., Co. 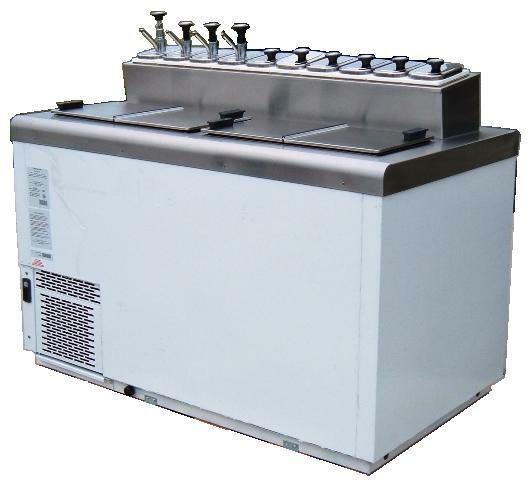 The sliding lid new style flavorrail, BD-X-JR, is designed for those individual and chain shops that need to have a clean work-area/counter space for making smoothies, shakes, and blizzards, and other blended type treats. The sliding lids allow easy access to your ice cream products in the freezer; while adding blend-in toppings, and, then mixing each order, in the same floor space. Mixers and Blenders can be easily installed on the back shelf of the BD-X-JR cabinet. Hand sinks, 3 hole sinks, and dipper-wells can be added to either side of the cabinet for your sanitation needs. In the below video Kelley Smith, President, C. Nelson Mfg., Company, expands on the differences between the sliding lid freezer vs. the flip lip freezer. He also points out the benefits and features of the C. Nelson cabinet vs. his competition. You can tell Kelley is proud of what his team builds in Oak Harbor, Ohio, USA. This entry was posted in Ice Cream Cabinets, Ice Cream Retail and tagged cnelson, ice cream dipping cabinets, kelley smith, milk shake work stations, smoothie work station on January 23, 2014 by George Dunlap. Tell me you thoughts on either of these 2 freezers.